Last week we offered three recipes for starting your days off right for the new year, and today we present to you a pizza dough recipe that will satisfy your love for pizza and cut down on your sugar and oil intake at dinner, lunch, or even breakfast – a win-win! Add your favorite toppings for tonight’s meal, or freeze for use later on in the week. Enjoy! In a small bowl, dissolve yeast in warm water. Let stand for about 10 minutes, or until creamy. In a large bowl, combine flour, wheat germ and salt; make a well in the middle, adding honey and yeast mixture. Stir well to combine, cover and set in a warm place for about 5 minutes to rise. Store in an air tight container or storage bag in the freezer, or move on to step 4. Roll dough on a floured pizza pan or stone and poke a few holes in it with a fork, let sit for about 5 minutes more and then bake in preheated oven for 10-15 minutes. 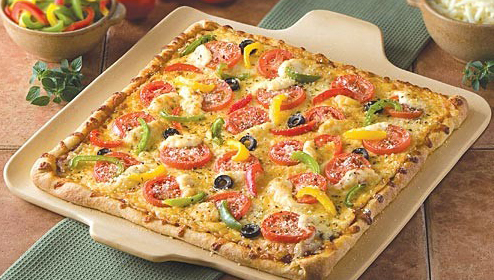 Remove from oven, add desired toppings and bake for about 20 minutes or until crust reaches desired crispiness. This entry was posted on Tuesday, January 12th, 2016 at 8:00 am	and is filed under Breads, Dinner, Lunch, Pizza, Recipes, Tasteful Tuesday. You can follow any responses to this entry through the RSS 2.0 feed. You can leave a response, or trackback from your own site.